Why would I need self storage in Bronx, NY? There are a variety of reasons why you might need self-storage in Bronx, NY. How much is a storage unit in Bronx, NY? The cheapest storage unit in Bronx, NY is $45.00 per month. What size storage units do you have available in Bronx, NY? In Bronx, NY we have sizes that range from 4'x4' to 10'x30' to suit your storage needs. How much is it for a 4'x4' storage unit in Bronx, NY? The cheapest 4'x4' storage unit in Bronx, NY is $57.00 per month. The Bronx is the northernmost of the five New York City boroughs and is known as a vibrant, booming area for families and single professionals alike. In the Bronx you'll find a variety of shopping and dining options, ranging from local corner favorites to well-known chains. The area has a lively nightlife and is home to many different bars, grills and lounges. Here you'll also find the Bronx Zoo, the New York Botanical Gardens and Woodlawn Cemetery. The Bronx is full of history and culture and is recognized as the home of professional baseball's iconic Yankees team. Author Edgar Allan Poe penned one of his most famous works here. The area was also critical in the launch and evolution of hip-hop music, which many say was started at a birthday party on Sedgwick Avenue here in 1973. In the Bronx you have nearly 50 different neighborhoods to choose from, each one with a distinct personality. The close proximity to Manhattan gives easy access to jobs, entertainment, shopping and large universities nearby. Although the Bronx is one of the most densely populated counties in the nation, a significant portion of the area is dedicated to parks and green spaces. Its major parks are connected via a network of thoroughfares designed by John Mullaly, known as the father of the Bronx parks system. In many parks of the Bronx, you can experience rotating art installations, botanical gardens and historic points of interest. The job market in the Bronx is extremely active, with many jobs available in the retail and food service industries. You also have the option of commuting to any of the nearby boroughs for work, opening up a wide range of jobs and industries to choose from. Public schools in the Bronx are managed by the New York City Department of Education, with six separate districts in the borough. In addition to public schools, you can choose from a variety of private schools, including faith-based schools and independent academies. You'll find that the Bronx is home to many specialized high schools, offering study tracks focused on fine arts, science, government and music. If you're planning on pursuing post-secondary education, the Bronx has several colleges and universities to consider. Fordham University is one of the oldest campuses in the area, founded in 1841. 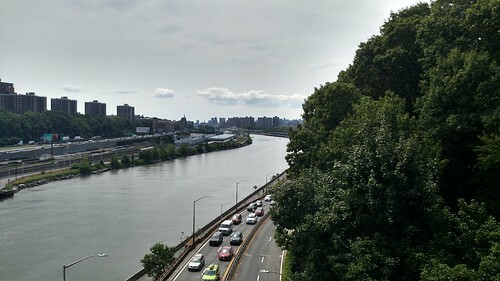 Columbia University is across the Harlem River in Manhattan. Utilities: The main electricity provider in the Bronx is Con Edison, and water services are managed by the New York City Water Board. Garbage and Recycling: The City of New York provides collection of trash and recyclables, and some neighborhoods can also request pickup of organic waste. Transportation: The Bronx and the larger New York City area have one of the most well-established public transit networks in the nation, offering transportation via train, subway and bus. You may find that owning a car isn't necessary, thanks to the convenient public transit in and around the Bronx. There are many housing options in the Bronx, spanning a wide range of styles and budgets. You can choose from single-family homes, apartment buildings and more. Although the cost of living in the Bronx is higher than the national average, it's one of the lowest of New York's major boroughs. Our lowest priced units in Bronx, NY average $82.60 per month. 731 people have reserved units in Bronx, NY in the past 30 days. There are 10 locations within Bronx, NY's city limits. There are 7 locations in Bronx, NY that offer AC and Heating features.